ISBN M230651516. 22.00 x 31.00 cm inches. This facsimile of an original by Johann Pachelbel is part of our Dominantes collection. Hexachordum Apollinis. [Six arias followed by variations, for the organ or the harpsichord]. Edition: Nuremberg, l'Auteur, 1699. Presentation by Philippe Lescat: the publication - the contents - the Cabala - understanding the score - translation of the dedication. This facsimile is the only edition available to players. 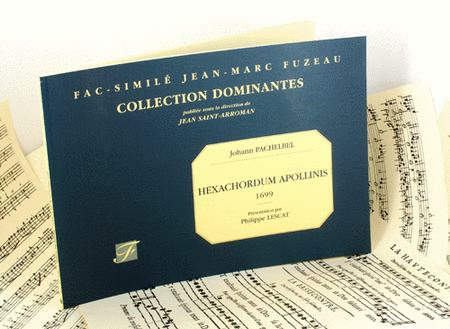 Collection supervised by the musicologist Jean Saint-Arroman, professor at the Conservatoire National Superieur de Musique et de Danse of Paris and at the CEFEDEM Ile de France (Training Centre for Music Teachers). He is the author of the majority of our prefaces and has also been involved in library searches. Facsimile of a copy in the British Library of London (England). Anne Fuzeau Classique propose period copies of classical music scores.